The debugger in the SQL Server Management Studio (SSMS) for the upcoming SQL 11 (“Denali”) is packed with exciting features.The new SSMS is a derivative of the VS2010 shell and therefore extends the same debugging experience (with the obvious differences related to technology) that it would deliver to let’s say a C# developer. As I mentioned in my previous post, the Data Tips are a very light-weight version of the Watch window. They allow you to view the value of variable within the current scope by placing the mouse pointer over the given variable when in break/debug mode. One can change the value of a variable at runtime from within the watch window to force the debugger to use that value instead of the normally computed value. Because the Data tips are a light-weight version of the Watch window, editing data in a data-tip should be possible. Let’s assume that after an hour or so of debugging, you identify a variable taking on an incorrect value, which you need to protect against. You stop the debugger, but forget to note down the offending value! Simply the thought of spending another hour debugging would give you a headache. Well, not if Data Tips are used. That’s because they hold the value even after the debugging session is over. All you need to do is to hover the mouse over the “pin” icon in the indicator pane and you will see that the data-tip containing the value from the previous session opens up with a balloon help saying “Value from last debug session”. Exporting & Importing Data tips is very similar to exporting & importing breakpoints. In fact, they even share the same limitation – upon import, the file path and name must be the same as it was when the export was performed. What would be your ranking? Do let me know. 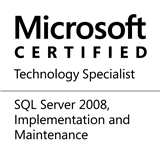 This entry was posted in #SQLServer, Blog, Imported from BeyondRelational and tagged #SQLServer on September 29, 2011 by nakulvachhrajani.